IoT devices interacting with each other within a P2P network are capable of measuring the pollution of water used for drinking and bathing. A combination of sensors, blockchain-based technology, and IoT can simplify the acquisition of relevant data on the composition of water in a river or sea. Surface water from freshwater sources accounts for more than 60 percent of the water delivered to American homes. But a significant pool of that water is in peril. Nearly half of rivers and more than one-third of lakes in the US are polluted and unfit for drinking, swimming, and even fishing. Contaminants such as chemicals, nutrients, and heavy metals degrade water quality and render it toxic to humans. States and municipalities should be provided with the possibility of quick, accurate and cheap water quality measurements. The problem is that the current systems for monitoring water quality are procured and monitored by states and municipalities. The research these authorities conduct is largely expensive and ineffective due to the low speed of data collection and processing. However, it is of real importance for city dwellers to be aware of what kind of water they drink. In recent times, IoT devices and unmanned drones, in particular, have come to environmentalists’ and service utilities’ aid. Although, the current systems suffer from centralized data storage and its unavailability for residents. 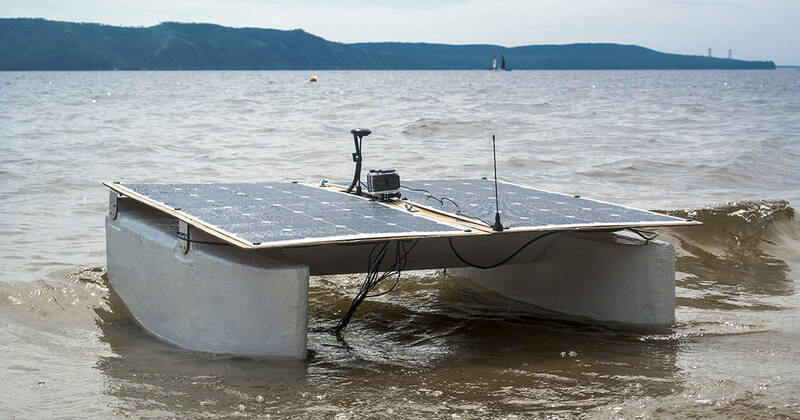 The scientist behind a project called “Drone on the Volga” came up with a solution that allows not only to measure the quality of surface water but also to create a decentralized market of data accessible to any interested party. The project has been deployed in Russia (Kuybyshev reservoir, the largest water reservoir in Eurasia, located on the Volga river) where 70% of drinking water comes from the surface. Since up to 60% of this water does not meet sanitary standards and more than 10 million Russians are currently lacking access to quality water that can be used for drinking, pollution remains a major issue in the country. The project utilizes Libelium’s water sensors in combination with the “Robonomics Network” platform created by developers specializing in smart cities and Industry 4.0 projects. A solar and battery-powered water drone can measure water temperature, pH, dissolved oxygen, water conductivity, NH4+, and NO3- ions. A controller takes measurements during its trip across the reservoir, sending this information to an onboard computer via USB. The computer is responsible for sending the data to the system through the protocol on Ethereum over 4G to make data public and connected with a specific agreement in the form of a smart contract. Combining blockchain, robotics, and IoT, the platform allows autonomous drones to communicate with one another and offer their services to customers. It enables people and machines to negotiate and reach “smart agreements” without a centralized exchange. Says Alisher Khassanov, industrial engineer of the team behind the platform. The drone offers its services through a web application, allowing any user to demand a service. Usually, the mission generates parameters such as a position of the drone, movement, speed, measured water quality parameters, and other secondary requirements. the liability contract is fulfilled, and all the participants’ obligations are satisfied. The network enables direct robot-to-robot and robot-to-human communication by creating a marketplace of robot liability contracts on the Ethereum blockchain. These contracts combine economic and technical parts into one transaction. Once recorded, the data becomes immutable and cannot be altered. The decentralized technology allows for the creation of a distributed P2P network with a data protection mechanism. Smart contracts allow for the transfer of commands between agents, the writing of any custom logic and then saving of data to a public blockchain so that all the stakeholders can access it using cryptographic identifiers. Supplemental data service providers are the source of information supporting the system and give companies measuring water pollution the power to purchase necessary information, enabling safe operations over a designated area. This, in turn, enables a marketplace with economic incentives for companies to supply data such as weather, topography and risk evaluation. The platform developers managed to solve a vital problem that is relevant for IoT devices and robotics factories – the elimination of the bottleneck represented by a single IoT platform receiving data from devices, with this centralization of data putting it at risk of being stolen or lost. All the data is collected and can be traded in a decentralized marketplace, instead of being owned and used solely by the IoT platform. Devices are able to interact directly with each other and the outside world, meaning the failure risks presented by a single point are minimized. By combining robotics, blockchain, and IoT, this project may well serve as the base for a continuous water quality monitoring system, with no need for human interaction. A matrix of data coming from drones could feed AI systems to easily and quickly detect a source of pollution.